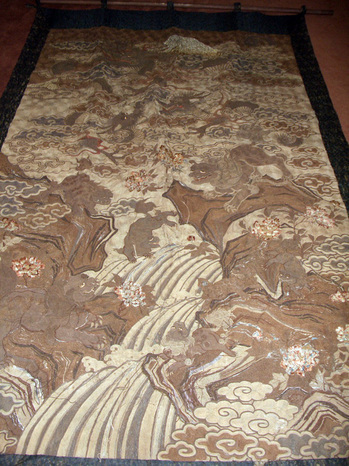 We recently unrolled a large, Japanese embroidery for the first time in many years. 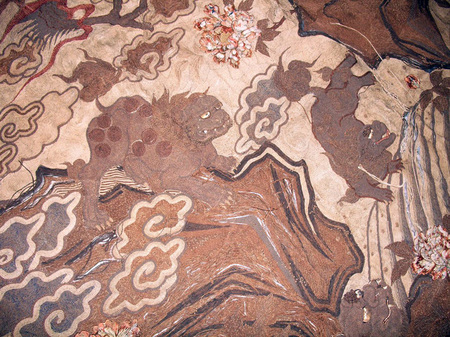 At the top of the ten-foot tapestry is a white mountain that might refer to Tendaisan, the holy mountain of the Tientai sect of Buddhism. This site is also found in the Japanese No play, Shakkyô (The Stone Bridge), by Kanze Motokiyo (1343-1443). The play tells the story of a wealthy Japanese businessman who renounces his life and becomes a priest. He makes a pilgrimage to Tendaisan and the grave of Monju Bosatsu, who is usually seen with an animal known as Shishi, similar to a lion. 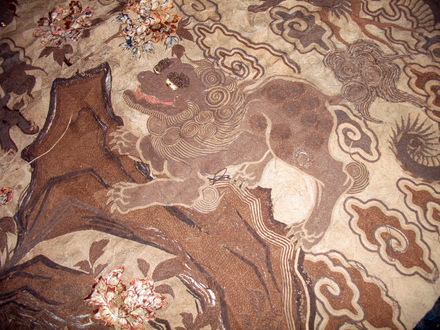 The embroidery has many of these Shishi figures, climbing and tumbling down the design. According to one legend, the lioness would take her cubs to the Shakkyô and only the ones who were capable of climbing to the top would be nurtured by the mother.